I’m always on the lookout for a new “To Do” type of app that will help me remember to do certain tasks that I’m trying to turn into behaviors. I’ve been successful with a few behavior changes, like working out regularly, but others just don’t seem to stick (like working on my book). The latest app I tried is “Lift“. 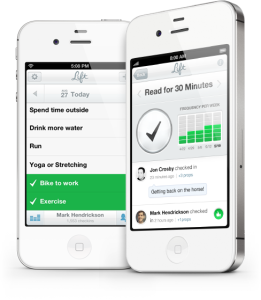 It is a very well-designed, clean app that makes it easy to add new behaviors that you want to turn into habits. Things like: Drink more water, exercise every day, work on my special project, go for a run, etc. So, I have been trying to use it for a few months now with no real success. I opened it again today and the reason for the failure hit me: No one is really there. Well, at least no one that I know or care about. You can let Lift access your friends list on Facebook or invite people by email address to join you there. But, many of these habits that you want to form are personal and private. I don’t want my friends to see all of that. Some of them, sure. But, all of it? No way. Therein lies the problem. When no one is there, I don’t care. No one is paying attention. I don’t feel accountable to anyone. The few strangers that randomly give me props don’t mean anything to me. We haven’t built any type of relationship. They don’t know me at all. So, their praise is empty. Who cares? It really isn’t enough for me to have some list reminding me to perform some behavior. The empty checkmark isn’t enough to prompt me to take action. The empty bar chart doesn’t make me feel bad enough to take action. I can always justify why I wasn’t able to perform that behavior. I can always rationalize that I will “do it tomorrow” or “next week”. So when you want to make a lifestyle change stick, let someone know that you are signing up to do just that. Even better, find someone who will make the lifestyle change with you. There is nothing like accountability to keep you on track. We don’t want to let down a friend or partner who is counting on us. We don’t like to admit or explain our failure. Try it with your next lifestyle change and see how it works for you.